December, one of my favorite months, is here to conclude 2011. Late fall turns to winter, and the darkest day of the year arrives along with celebrations of family, food, and return of the light to the world--in the northern hemisphere. Our friends in Australia and Africa celebrate quite differently as daylight approaches its yearly maximum. It can be hard for those of us in darkness to imagine the light, nor should we try. Short, dark days have a beauty of their own as we retreat indoors, rest more, and find sustenance in light from within. In late fall seasonal cooks think of both pumpkins and cranberries. A few years back I had what seemed like a wacky idea to use both in bar cookies. I was surprised that Weight Watchers (affectionately known as dub-dub at our house) had already created a recipe, and that members had given it high ratings. 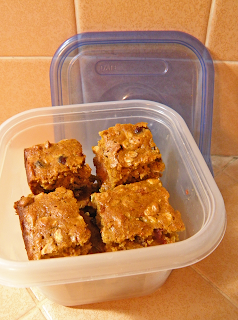 This low-fat, not-too-sweet cookie has a wholesome, oat-like taste, like low-sugar granola bars. They are a refreshing alternative to super-sweet, buttery holiday cookies. So, I changed a few things, as usual. Bar cookies have good tolerance for alterations, so feel free to create your bars differently. Some suggestions are below. The amount of cranberries seemed skimpy, so I upped it from 2/3 cup to 1 cup. The original recipe called for one egg and one egg white, and I hate to waste a nutritious egg yolk, so I used 2 eggs. I substituted butter instead for reduced-calorie margarine. Instead of extra cranberries, you could add 1/3 cup chopped walnuts to add more texture and an additional flavor. More calories, but this moderate amount of nuts adds healthful oils to the bars. Some WW members use egg substitute instead of eggs. Other WW members commented that they use whole wheat flour or oat bran instead of all purpose flour. 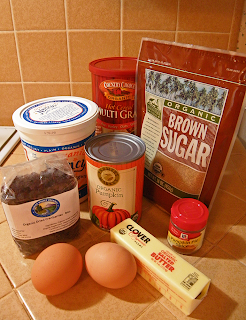 I substituted multi-grain hot cereal for the oatmeal (rolled oats), because I had that on hand. It added a bit of crunch, oatmeal would be softer texture. Instead of buttermilk I used very thin yogurt. If the yogurt were too thick, I would have added a little soy or cow’s milk, again based upon what I had on hand. WW says that if you don’t have pumpkin pie spice, substitute 1 1/2 teaspoons ground cinnamon and 1/4 teaspoon each of nutmeg, ginger and clove. In fact, you could use any proportion of spicing that appeals to you. 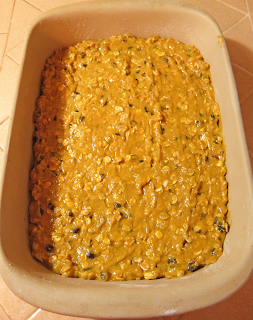 There is a problem with the quantity of pumpkin in that using 1 cup means that about 1/3 cup is left over from a 15 oz. can. One WW member used the whole can but said her husband liked the flavor but “found the texture a bit spongy.” Perhaps the extra egg yolk (since recipe originally contained only one) would take care of this…but since I was making these mostly as gifts for those who work for me, I didn’t want to risk sponginess. Next time I’ll experiment with the whole can. Readers are probably way ahead of me on this one. You could make your own fresh DIY pumpkin puree instead of canned if you have a pumpkin and some extra time on hand. Please post any successful variations that you try! 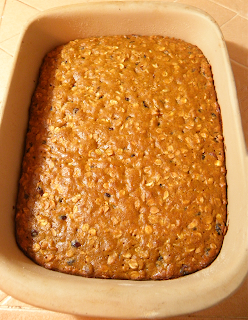 Preheat oven to 350 degrees F. Lightly coat a 9x13-inch baking pan with cooking spray, then dust lightly with flour. In a large bowl, cream sugar and margarine with an electric mixer; beat in eggs, pumpkin purée and buttermilk. In medium bowl, combine flour, oats, pumpkin pie spice, baking soda and salt. 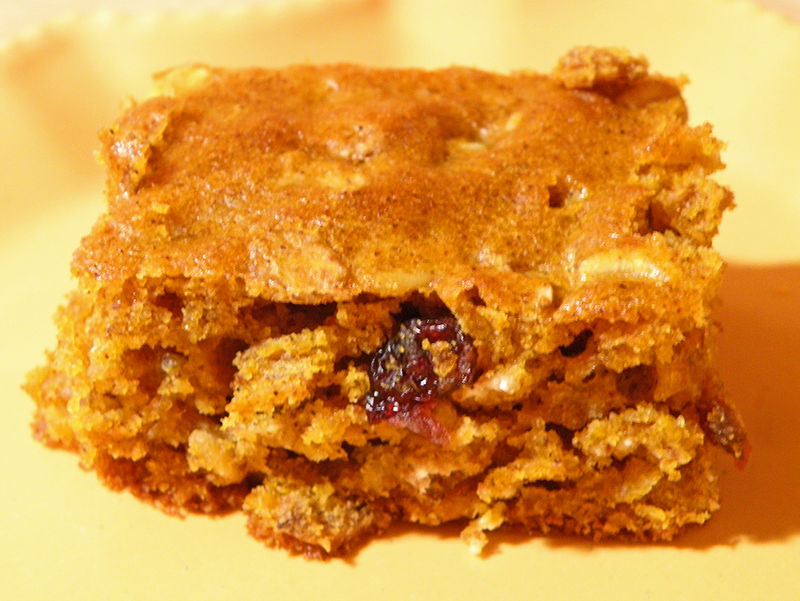 Stir into pumpkin mixture just until moistened, then add cranberries and mix gently. Spread batter in pan and bake 20 to 25 minutes or until center springs back when gently pressed. Cool and cut into 18 bars. Note: Pampered Chef stoneware baking dishes bake bar cookies to perfection. I tried one years ago and have never looked back. Link for proper size pan below.